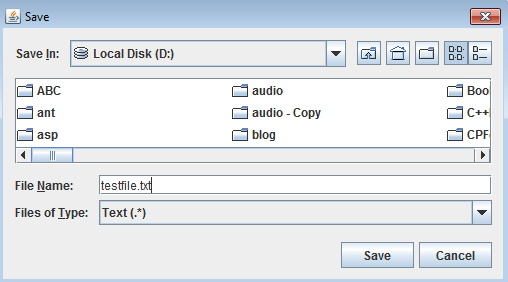 JFileChooser is a component that you can use to display an open file dialog to select a file or many files for opening or to display a save file dialog to select a directory in which you can save text to a file. To display a open file dialog, you need to use the showOpenDialog(Component parent) method of the JFileChooser object. By using its showSaveDialog(Component parent) method, you will have a save file dialog. Below are constructors and commonly used methods of the JFileChooser class. creates a file chooser pointing to the user's current directory. creates a file chooser pointing to the specified File path. creates a file chooser pointing to the specified string path. return a selected file object. returns all selected file objects. The user is able to select many files from the file chooser when set the multiselection property to true by using the setMultiSelectionEnabled(boolean b) method. sets the file filter to the file chooser. allows single or mutiple files selection. 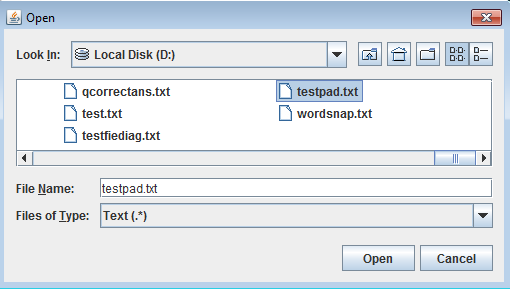 displays an open file dialog. displays a save file dialog.